Tate’s Bake Shop got its start when 11 year old Kathleen King began baking cookies to sell at her parent’s farmstand. Her love of baking and dedication to quality made her crisp, buttery cookies legendary in Southampton, and were the inspiration for what became Tate’s Bake Shop. Over the years Kathleen has perfected a full line of traditional, handcrafted baked goods with a focus a creating the tastiest treats made with the highest quality ingredients. * Tate’s Bake Shop does not ship cakes. All cakes must be picked up at the store in Southampton. Interested in ordering one of our scrumptious cakes? Please call the bake shop at 631-283-9830 to place and pick up your order today. Be sure to ask about our special seasonal cakes – we’re always creating something new and delicious! Please note that we cannot ship our cakes, all cakes must be picked up at the Southampton store. Tate’s singular chocolate cake is made with rich fudge filling and fudge icing…wow! This moist chocolate cake is our idea of chocolate heaven! Imagine a moist yellow cake with creamy coconut filling, covered in coconut buttercream icing and coconut flakes. Sound good?! Tate's singular chocolate cake with rich fudge filling and fudge icing...wow! This flavorful chocolate cake is our idea of chocolate heaven! Our Marie Antoinette Cake is a favorite and delicious from top to bottom. We begin with a layer of yellow cake, a layer of raspberry jam, and one of raspberry buttercream, followed by layers of chocolate cake, chocolate mousse, and a final layer of yellow cake iced with vanilla buttercream. The cake is finished with marzipan and an apricot jam glaze with cake crumbs and almonds on the side. As was so famously said "Let them eat cake!" Kathleen's scrumptious carrot cake is moist, delicious and dense with carrots and apples - sweet, but not too sweet! Our mouthwatering cream cheese filling and cream cheese icing make this cake irresistible. Our take on a classic dessert: Tate's Golden Fudge Cake is heavenly and perfect no matter the occasion! This light and moist yellow cake is topped with creamy fudge icing. A luscious treat: our Lemon Cake is filled with lemon curd and lemon buttercream icing and finished with cake crumbs around the edges. A lovely lemon tang and just the right amount of sweetness makes this a bake shop favorite. Scrumptious, seasonal cupcakes are available in a variety of flavors and whimsical decorations for holidays and special occasions. Most often requested? Our sea salt caramel, coconut, cookie dough, and red velvet cupcakes. Staff favorite? Without a doubt the peanut butter cupcake - dark chocolate cake and a creamy peanut butter frosting - what's not to love?! Call the shop to find out what we're baking today. Mix and match your favorite Tate’s Bake Shop cake, filling and icing for the perfect cake to serve at your next birthday or dinner party, or when you simply want a special dessert. 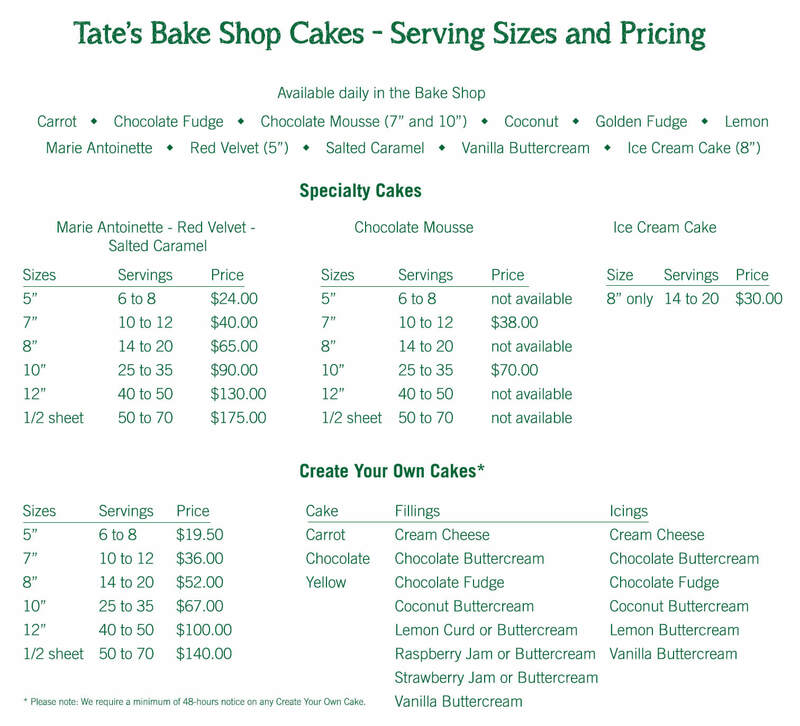 Give the bake shop a call for choices and to place your order. You’re going to want to try them all!